The location of Butte County in the state of California. Butte County is a county in the state of California. It is in the United States. The county borders Tehama County to the north and Glenn County to the west. It is in the north part of the Central Valley of California. 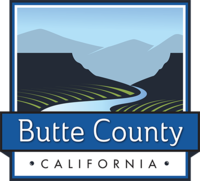 Butte County was founded in 1850. Its county seat is Oroville, and its biggest city is Chico. The county has a land area of 1,677 square miles (4,343 square kilometers), 38 square miles (98 square kilometers) of which is water. The Sacramento River flows along it in a north-south direction and the Feather River flows through it in an east-west direction. The Sierra Nevada mountains rise above the county on the east side. California State Route 32, California State Route 70, and California State Route 99 run through the county. Airports in the county include Chico Municipal Airport, Oroville Municipal Airport, Paradise Airport, Ranchaero Airport and Richvale Airport. This page was last changed on 15 September 2018, at 16:52.